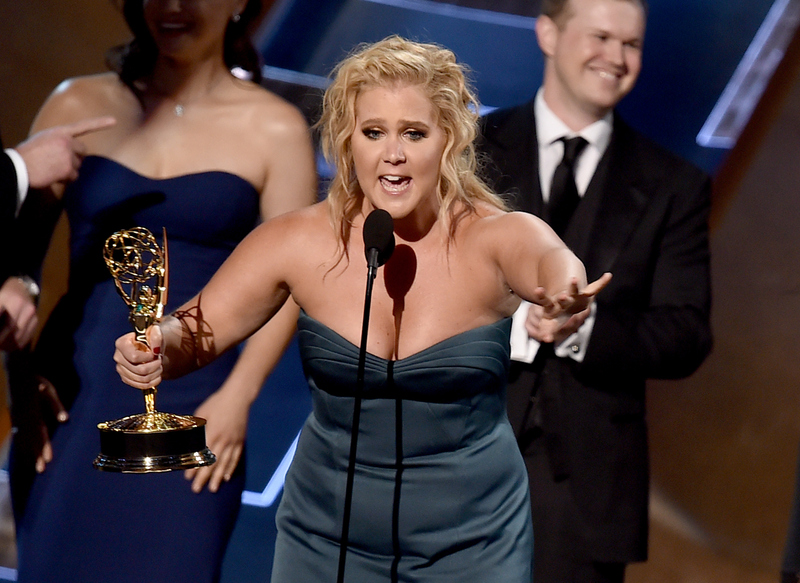 Who Is Amy Schumer's Makeup Artist Responsible For Her Emmys Smoky Eye? When the cast of Inside Amy Schumer took home the first-ever Emmy for Outstanding Variety Sketch Series there was one question lingering in many viewer's minds: Just who is Amy Schumer's makeup artist? Just who is the elusive MUA responsible for Schumer's "sort of" smoky eye she deemed exemplary enough to mention in her acceptance speech? Turns out the girl behind the speech-worthy cosmetic triumph is none other than Andréa Tiller, a frequent collaborator with Schumer, who also counts Carly Rae Jepsen, and NYLON Magazine among her clients. In addition to the fact that Schumer tearfully thanked Tiller, there's no denying that her eye makeup did indeed look pretty darn on point. Schumer was right to dub it a "sort of" smoky eye, since it was high impact, yet clean and sharp, and not too overpowering, especially when paired with the rest of her (mostly) simple and classic ensemble. The look featured gorgeously metallic bronze shadow swept across the mobile lid in a slight cat-eye shape, along with dark brown shading in the outer corners, a lot of smudgy eyeliner, and some mega false eyelashes — and the combined effect was pretty darn fabulous. In other words? Yes, it handily deserved the shout-out it got (whether it was said jokingly or not). Tiller quickly took to Instagram to instruct us all on how to get Amy's look, listing all the products used, from Urban Decay Eyeshadow in Baked (Naked Palette devotees should be pretty familiar with this shade) to the absolutely stunning Laura Mercier Kohl Eye Pencil in Black Turquoise (to match her Zac Posen gown, of course). For her part, Tiller, who is a Peruvian makeup artist currently based bicoastally in New York and Los Angeles, was pleasantly surprised by the shoutout — she joked that she heard about the speech through social media, and she told Refinery 29, "What an unexpected sweet thing she said — I felt the love and I'm happy she loved her makeup! Mission accomplished!" Indeed.